Después de cumplir 8 años desde la inauguración de Vicente Torns Slovakia, el 17 de septiembre 2015 se celebró una jornada de puertas abiertas en la planta, contando con la presencia de las autoridades locales y el embajador español en Eslovaquia. Los visitantes pudieron contemplar la segunda máquina de CTC, la cual había sido puesta en marcha pocos meses antes. After 8 years since the inauguration of the plant VICENTE TORNS GROUP in the city of Kosihy Velké Kosihy and continuing with its policy of expansion and production of new products, VICENTE TORNS SLOVAKIA A.S. has completed the installation of the second of three machines for the production of Tape Transpose (CTC) .Within its desire for modernization, growth and continuing its commitment, Velké Kosihy’s factory has recently installed the second of three machines for the production of the plate transposed, outstanding products for reducing electrical losses and therefore with all winding. 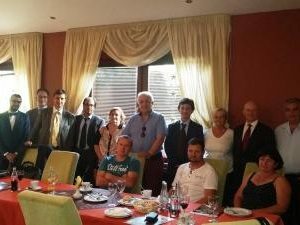 Because of that, a meeting was organized on 17 September 2015 in these facilities with local authorities, the Ambassador of Spain in Slovakia and the aggregate commercial as well as a talk with officials from providers such enamel factory in order to address any issue related to the activity.